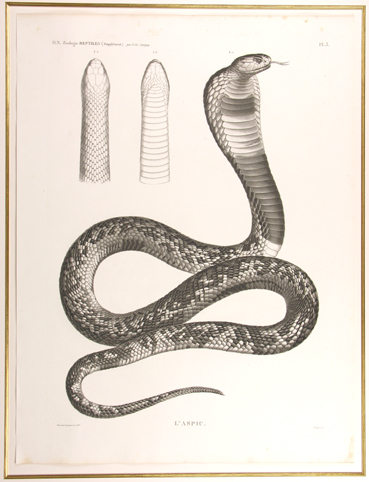 Histoire Naturelle - Reptiles - Supplement Plate 3 - Cobra ~ The cobra, being the dangerous snake of Lower Egypt, came to symbolize Lower Egypt itself. The Ancient Egyptians were very wary of snakes, especially the poisonous Egyptian cobra and the black-necked spitting cobra, which could spit venom into the eyes of an aggressor. The cobra was adopted as protector of the king, and representations, with its hood raised and ready to spit venom, sometimes adorn the brows of various kings. The species is Naja haje, the common cobra in Egypt, known to the ancients as 'Djet'. Along with the vulture, the raised cobra forms the phrase 'Nbty' and is translated as the 'Two Ladies Name', one of the five names of Pharaoh.